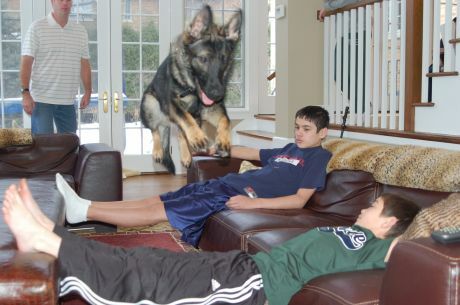 Havoc, a seizure alert dog trained at Alden’s Kennels, 6810 Barnard Mill Road, Ringwood, jumps over the legs of Kai (center – dark blue), who has epilepsy, and his brother, as their father sends Havoc across. It’s doubtful an intruder would walk into the Leisher house, come face to face with Havoc, a quietly resolute German shepherd, and decide not to leave in a big hurry. It’s nice having a security dog around and it’s hard to beat the kind of security Havoc offers. However, that’s not why Havoc is at the Leisher’s Wilmette home. Ashley O’Byrne, the master trainer with Alden’s Kennels, 6810 Barnard Mill Road, Ringwood, who trained Havoc, said the Leishers came to her looking for a seizure alert service dog for their 14-year-old son, Kai, who has epilepsy. The Leishers agreed that they seemed to hit if off well with Havoc right away. Kai’s mother, Judy Leisher, said having Havoc around has made a world of difference in the Leisher home. Havoc is trained to warn the family, which includes Kai, Judy, Kai’s father, Scott, and Kai’s three brothers and sister. Amazingly, Havoc not only warns the family that Kai is having a seizure, he warns the family before Kai has a seizure. While Havoc is trained to warn the family if Kai is having, or will have a seizure, Havoc is actually trained well beyond that. O’Byrne said Havoc is trained as a security dog, narcotics dog, for search and rescue, to find cadavers and in all phases of American Kennel Club utility. Scott Leisher said Havoc is trained to follow more than 200 commands. Not only does Havoc serve the Leisher family as a service dog, he is also very protective of the family. This turned into a small problem one day that the family laughs about now. Judy and Scott had a contractor working in the house to expand the walk-in closet in the master bedroom. Downstairs, the family was calling Havoc and becoming concerned because Havoc always came right away. It wasn’t that Havoc was staring at him, it was the warning look in Havoc’s eyes as he stared. “The electrician was going to call his boss to call us so he could get out of the closet,” Scott Leisher said. Kai said he was a little nervous about Havoc when they first met. Judy Leisher said Havoc wasn’t the first dog they went to see at Alden’s Kennels. They said they found out about the kennel by looking online at http://www.petfinders.com. O’Byrne had another dog named Haley but thought that dog was too rambunctious for the Leisher family. The Leishers made several trips up to Alden’s Kennels to meet Haley and then to meet Havoc. Since bringing Havoc home, the Leishers have no regrets. Kai said it’s rather cool having a dog around that looks like a wolf. However, instead of intimidating Kai’s friends, Havoc has become one of the pack. Kai and his friends like to do tricks with Havoc. For instance, all the boys will line up on the couch with their feet out on the ottoman. Then, they’ll have Havoc jump over them. The athletically inclined shepherd takes the leap in stride. The family has also taught Havoc to talk. When they tell Havoc, “I love you,” Havoc howls back the same words. The Leishers have another dog – Bailey, a standard poodle. The two dogs also get along famously. Scott Leisher said it seems like Havoc lets Bailey take the dominant role sometimes. He also said Bailey seems a lot braver when she’s standing behind Havoc. Judy Leisher said there are three million people in the country who are diagnosed with epilepsy. She said another 200,000 are diagnosed each year, which suggests a recent improvement in diagnosing the disease. Judy Leisher is not only thankful for Havoc, she also has a bit of gratitude for Haley, the dog they didn’t bring home. Before they met Havoc, they went up to Alden’s Kennels to see Haley again. However, Haley was adopted by another family the day before. “It was almost like Haley brought us there to find Havoc,” Judy Leisher said. For information about how you can help in the battle against epilepsy, visit: http://www.cureepilepsy.org. To learn more about Alden’s Kennels, visit: http://www.aldenskennels.com.